This statement is one of the most powerful, life altering, and difficult concepts to truly believe. But believe we must. Neal A. Maxwell said asking the Lord to show us our true weaknesses is "a painful, vital part of coming unto Christ." And if men come unto me I will show unto them their weakness. I give unto men weakness that they may be humble; and my grace is sufficient for all men that humble themselves before me; for if they humble themselves before me, and have faith in me, then will I make weak things become strong unto them. There is the doctrine. Pure and simple. This week Brent has been out of town. It is always an adjustment to run the household alone. Thankfully, it rarely happens. As I knelt by my bedside praying this week certain events from that day, and days past began to flash through my mind. It was quite a slideshow. A distinct, clear pattern of behavior demonstrated in myriad situations suddenly became crystal clear. The Lord unmistakably showed me a personal weakness. I was humbled. Not that I didn't realize earlier this was something I needed to work on, but the message was clear, the time has come to change. On a side note...we all receive revelation in different ways. Recognizing the ways the Lord speaks to me personally is critical. Often I find the Lord speaks to me when I am praying, not in words but in pictures, and where my mind goes. I realize it isn't wandering, instead there is often a message and purpose. This was the highlight of Callista's day, taking a "ponderous" (snicker, snicker) picture of Mom with Mom's camera! My prayer immediately turned into a plea for help. I need help because really this has been a part of my character from the time I was a little girl. Each morning I have supplicated the Lord for the help of the Holy Ghost as I seek to change. Each night, my heart has overflowed with gratitude because I feel myself changing. Changing only because of the gentle whispers of the Holy Ghost in the moments I most need them. My tendency to hurry. It doesn't sound huge, but the picture was clear to me, I was detracting from the spirit in my home with my rushing. So instead, I tried to enjoy Ellery sitting at the piano and wanting to gaze and the pictures in her piano books, and talk about each and every lyric to all her songs. I reminded myself that taking longer is more important than finishing on time and creating contention. And she takes a long time. She loves to just ponder. Ponder the sentence she just read, or the picture. Ask questions. What a lesson to me. 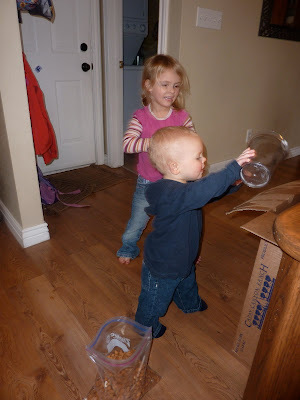 Emmett and Callista "helping" me move our raw almonds from the box into bags for the freezer. I tried not to rush Emmett through his bath or his stories. Following his cues instead of mine. I let Callista sit on my lap for as long as she wanted and watch home videos on the computer and talk about every one of the thousands of family pictures in the "picture folder" on the desktop. All these little things brought a little more heaven into our house. I wasn't perfect. But with the help of the Lord I was better. I have faith "his grace is sufficient" for me. This weakness can and will become a strength to me in time...if I continue to be humble and seek his help. What a wonderful realization. It is amazing what we can learn from those little gems.